Planning on purchasing a bouquet of bright blossoms for your sweetheart this Valentine’s Day? Cut flowers are cute, but they turn into a gloomy mess within days of delivery, destined for the trash before the chocolates can all be eaten. Instead of the standard bouquet, send a living, lasting Valentine’s Day orchid, an icon of beauty. With basic care, a potted plant can last as long as your love. 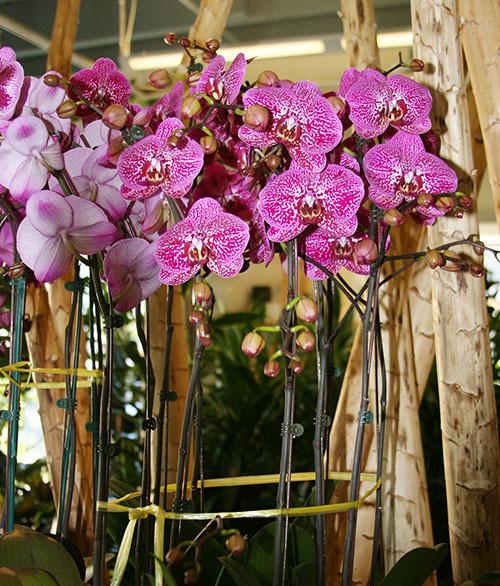 Orchids are continually the top gift plant to give, from your true love to your dear mom. Beautiful, exotic and somewhat mysterious, they are a powerful, towering symbol of your enduring affection. Their heavenly and romantic scent last for weeks rather than the few days of a typical cut flower arrangement. Our regular customers enjoy their plants for Valentine’s Day all year round. Make your dollar last and select an elegant orchid arrangement that can be enjoyed much longer than the usual Valentine’s Day limp bouquet. For the same cost of a red rose bouquet, you can buy you a long-lasting orchid arrangement, which will continue to give pleasure to the eye and beholder throughout the year. Valentine’s Day plants grow and thrive, just like your love. Valentine’s Day is the perfect time to show your gratitude to those who mean the most all year long, from your parents, to friends and relatives who have been there through the thick and thin of it, or simply for someone who you may feel is in need of a little pick-me-up. It’s nice to feel know you are loved. Show the people close to you that you care, with a gift that will last. Our range varies with the seasons and availability. Does your bathroom have any plants in it? Why not! Green Walls in Office Design—What Are the Benefits? ← Green Walls in Office Design—What Are the Benefits? Interior Gardens © 2017. All Rights Reserved.